Exercise is key when it comes to losing weight and keeping it off. But when you're making changes to your diet to get to your ideal weight, you may wonder about the best time to eat. Turns out, you need to eat both before and after your workout to get the most benefits. The timing of your pre- and post-workout meal or snack is what's most important, however. Consult your doctor before starting a weight-loss plan and making changes to your diet or exercise program. When you're exercising to lose weight, you want to make sure all your hard-working muscles are used to their full potential. Making sure you eat before you work out helps fuel your muscles so that they perform their best. To prevent indigestion while working out, you should eat a meal three to four hours before exercising. Be sure to include healthy carbs, such as whole grains, fruit, vegetables or nonfat milk or yogurt, in your preworkout meal to ensure adequate fueling. 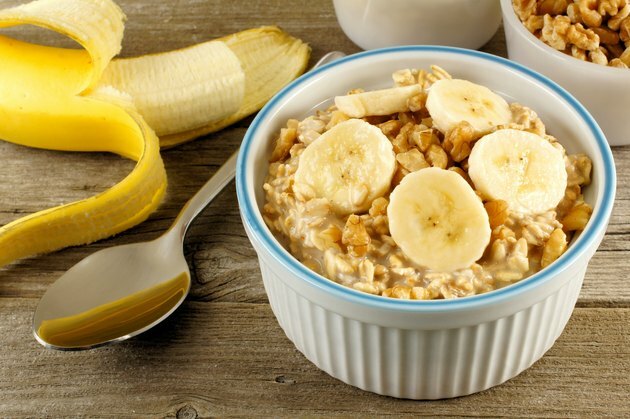 A healthy preworkout breakfast meal might include oatmeal with a few chopped walnuts and sliced bananas. If you work out in the afternoon, fuel up with a cup of bean and vegetable soup, whole-grain crackers, an apple and low-fat string cheese at lunch. If you exercise early in the morning and can't stomach a large meal, or it has been more than four hours since your last meal, you may benefit from a quick preworkout snack for a better workout. Your snack should be easy to digest, low in fat and small in size. A fruit smoothie with a tablespoon of nut butter or a meal replacement shake make good preworkout snacks. Plus, they're also good for hydration. Or, if you prefer something to eat, try a container of low-fat Greek yogurt with diced peaches for pre-exercise fuel. One of the most important times to eat when exercising to lose weight is immediately after your workout. Muscle-building is at its peak during the 30-minute window that follows your workout. The Colorado State University Extension recommends that your post-exercise meal contain a little carbohydrate, protein and fat to get the most benefit. If you're not feeling up to a full meal after your workout, a small snack will do. A glass of low-fat chocolate milk makes the perfect post-exercise snack, according to the Academy of Nutrition and Dietetics. Half a turkey sandwich or whole-grain crackers with hummus also make healthy options. Following up with a healthy meal after your workout can help replenish energy stores and preserve muscle mass. You don't need to focus on any one nutrient, but it is important that you eat balanced and healthy meals to ensure that you get all the nutrients your body needs not only for your workouts but for your overall health as well. This is also necessary when restricting your calorie intake for weight loss. A healthy and balanced meal should include lean proteins such as poultry or soy foods, fruits, vegetables, whole grains such as quinoa or oats and nonfat or low-fat dairy. Can I Exercise Without Eating Breakfast?